The fastest SSD-based USB 3.1 Gen 2 drives now available can transfer data at 800 MB/s—many are bus-powered, too. But, most desktop computers (including many new models) feature old-generation USB interfaces that can’t support that performance, and may not provide enough power to enable those bus-powered drives to function. Break through the bottleneck—install Sonnet’s Allegro™ Pro USB 3.1 PCIe card in your Mac Pro® tower, Windows® PC, or Linux(1) computer with PCIe slots; or Thunderbolt™ to PCIe card expansion system to support your fast USB drives at maximum performance. Connected to a single USB 3.1 Gen 2 SSD RAID device, Sonnet’s Allegro Pro USB 3.1 PCIe card supports data transfers up to 800 MB/s—transfers complete in half the time(2) compared with using a USB 3.1 Gen 1 or USB 3.0 adapter card! Made possible through the use of dual controllers, with two connected drives, each port supports simultaneous 660 MB/s transfers. With four drives connected, each port supports simultaneous 300 MB/s transfers! Ordinary USB-A cards require the connection of a separate power connector. The Allegro Pro draws the power it needs from the slot it’s installed in to power connected drives, enabling you to install the card in any compatible computer or Thunderbolt expansion chassis that doesn’t have these power connectors available. Got a Thunderbolt connection, but no PCIe slot? 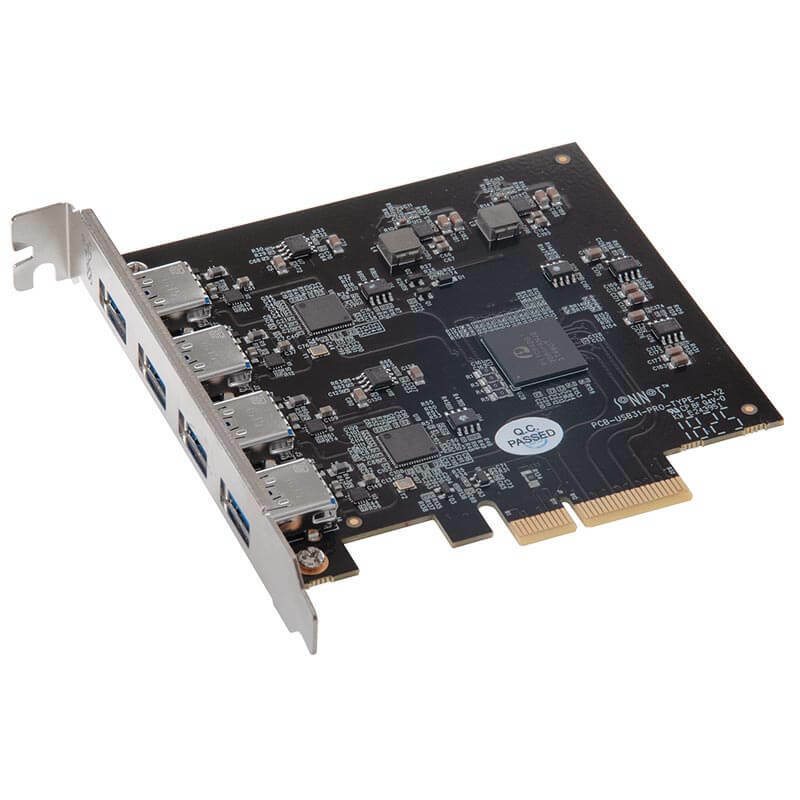 The Allegro Pro USB 3.1 PCIe card is ideal for use in Sonnet’s Thunderbolt 2 and Thunderbolt 3 to PCIe card expansion systems, including Echo Express™ and xMac™ desktop and rackmount chassis. Now you can add four SuperSpeed+ USB-A ports to your computer without expansion card slots.